Cowen and Company analyst Karl Ackerman's note to investors, a copy of which was provided to AppleInsider, claims research into the supply chain in Asia last week indicates approximately 53 million iPhone X units were built in the first quarter of 2018. This is said to be "largely in line" with an estimate made 30 days ago, suggesting the production would produce 52.5 million units. 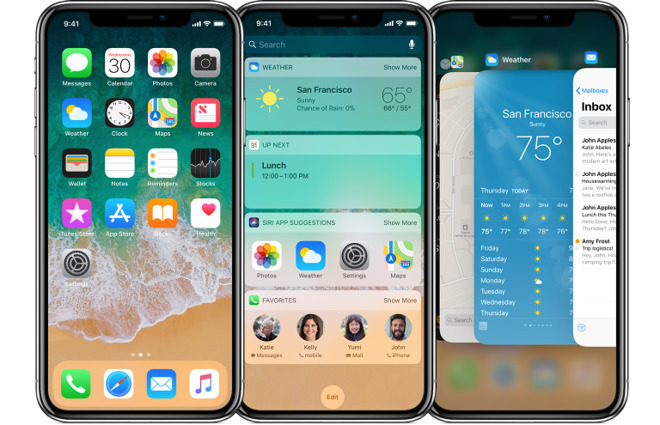 While overall units are largely unchanged, build expectations for the [iPhone] X continue to be curtailed," writes Ackerman, suggesting the second quarterly production will result in 17 million units, down from the month-ago prediction of 21 million. The analyst says the firm will still not rule out Apple reporting unit sales slightly higher than the number of units produced in the first quarter, "given the mismatch between builds and sell-in numbers" in the fourth quarter of last year. Going into the second quarter, the demand momentum for iPhones as a whole is thought to be under expectations based on the firm's field work, with a "more concrete view" of second quarter production putting the device family at approximately 42.5 million units. Ackerman advises this figure also includes 9 million iPhone X units, but is overall down from the firm's preliminary estimate of between 13 and 16 million units. The Cowen note follows other similar analysis by industry watchers suggesting the iPhone may not be sustaining the expected levels of demand. Yesterday's note from Nomura Instinet's Jeffrey Kvall saw "signs of trouble" in iPhone demand, echoing sentiments made by KGI's Ming-Chi Kuo in January suggesting Apple has reduced orders for the device. For incoming iPhones in 2018, the investor note advises "at least three new iPhone models" will ship this year. Of the three models, approximately 75 to 85 million units will be ordered by Apple for a model featuring a six-inch LCD screen, with another 100 to 120 million units expected for 5.8-inch and 6.5-inch OLED-based models. Based on current iPhone model specifications, this suggests a prediction of two different sized models with iPhone X-style displays, along with a third that could be closer to the more usual design of the iPhone 8. The production estimate of between 175 and 205 million units is far below a figure floated by DigiTimes yesterday, reporting industry sources as expecting orders for up to 270 million smartphone display panels from Apple in 2018. The display split is similar in that report, putting between 110 and 130 million units of OLED display panels in two different sizes alongside 60 to 70 LCD panels. Responding to rumors about the 'iPhone SE 2' that have surfaced in recent months, "We think that [Apple] has planned a second gen[eration] of the [iPhone] SE model," Ackerman adds after the main iPhone device predictions. The analyst admits that it isn't entirely clear if the "iPhone SE 2" will make an appearance for a supposed upcoming launch, stating "at this point there hasn't been a firm commitment to launch the device." Current speculation for the device suggests a possible launch in May or June for the "iPhone SE 2," and that it will largely be a refinement with increased specifications, rather than a radical departure that incorporates iPhone X design cues.